What a year – it’s time to celebrate! January 2018… the long-awaited arrival of our Fountain Gate store officially opened its doors to the public. 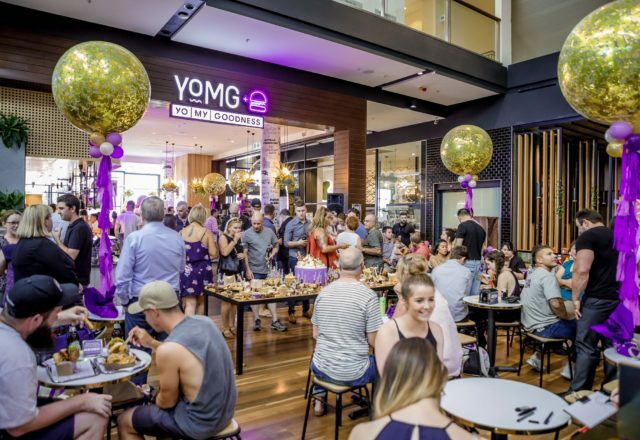 Sitting on the cusp of Westfield Fountain Gate, YOMG hit the ground running in its first few weeks and there has been no looking back since! We quickly became part of Westfield’s dining culture and the place to be for burgs, shakes, fries and fro-yo! Our Grand Opening saw our crew serve up 520 burgers during our Hour of Power with Free Yo My with Cheese and Bergerk Burgers. Our first weekend? 3K+ burgers! Since day one, the Fountain Gate locals have welcomed us with open arms and our crew have enjoyed every minute of serving up some flippin’ good burgs for each and every person that has walked through our doors. We love to celebrate and this weekend will be no different. It’s time for us to give back in the form of free burgs. This SATURDAY 19TH JANUARY, FROM 11AM – 12PM we will be serving up FREE YO MY WITH CHEESE AND BERGERK BURGERS. Door prizes, some YOMG merch up for grabs and the best burgs with the best crew. Clear yo calendars for Saturday fam! Head to our EVENT PAGE to make it Facebook official!